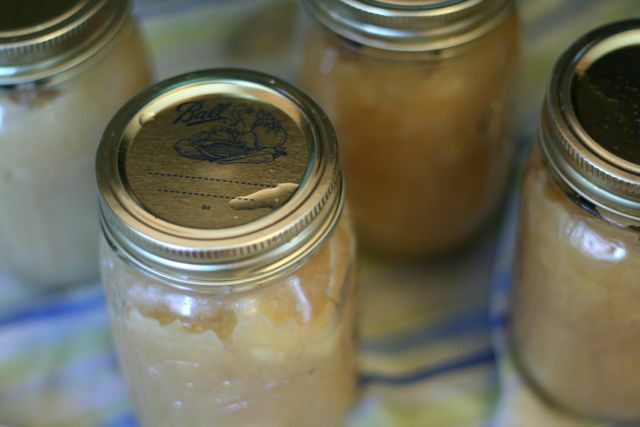 I don’t have all the fancy stuff most people have to make and can applesauce so I found instructions on The Whole Life Nutrition Kitchen on how to make and can applesauce with what you have in your kitchen and it worked like a charm. You will need apples, lots and lots of apples, cause a lot of apples don’t go very far. My friend has a few apple trees and she was kind enough to let me come and pick some… I think she had more than enough, so I may need to get more and make some more applesauce. The instructions were super easy to follow. The most time consuming thing was peeling and coring the apples. I do not have a apple slicer, peeler, corer. I added sugar and cinnamon to my apples because they were a bit tart. Let your taste buds be the guide, you can add some at the beginning and after an hour or so taste them and see if you need more. I also left the chunks in the apples, whatever didn’t turn to mush I just left as it was. This entry was posted in food, recipes on August 16, 2010 by Deanna. Oh my goodness. Mouth watering! 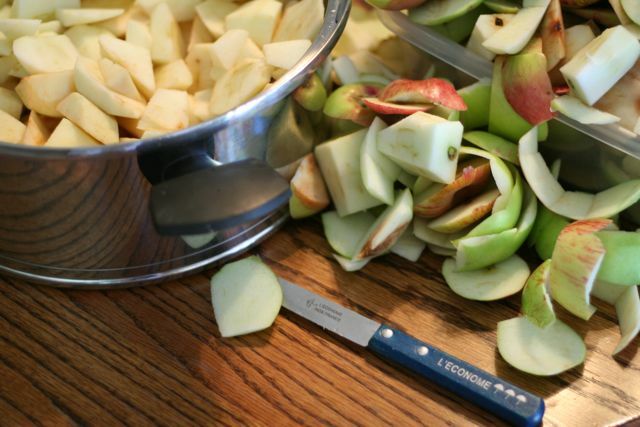 Next time you do this, let me know… I have an apple peeler/corer/slicer in my kitchen cabinet calling your name! My FIL has a hugeeeeee apple tree… it has been known to get as many as 12-13 bushels of apples off of it! 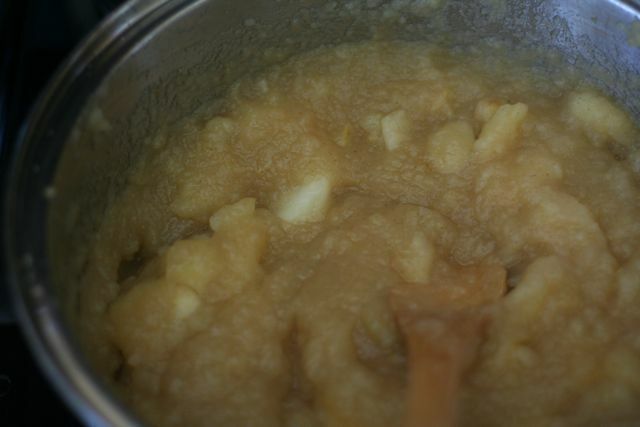 Anyway so we make chunky applesauce too! 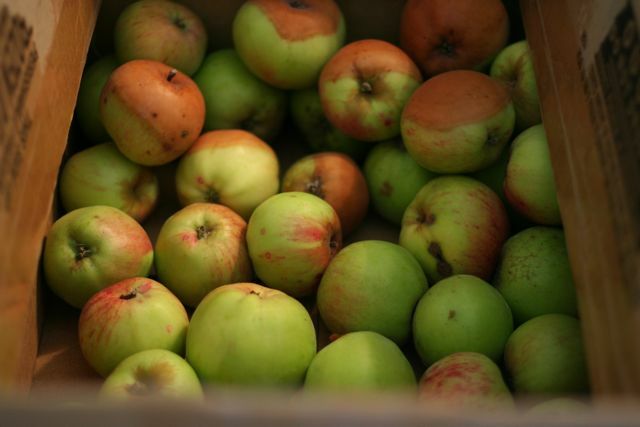 And these apples are pretty sweet so we don’t have to use much sugar with them. I just wanted to tell you that even though you have made sauce with them, you can use the sauce to make apple crisp! It’s great! Either butter or spray the bottom of the pan with cooking spray. Pour one quart jar or 2 pints of sauce into either a 9×12 cake pan or some sort of casserole pan, making sure you still have plenty of room for the topping. Then mix the following; 1/2 cup flour, 2 cups of quick oats; 1 cup of brown sugar, 2/3 cups of butter or margarine, 1/2-3/4 teaspoon of salt, 2 teaspoons of cinnamon. Mix all the above together and crumble over the top of the fruit. (You can use other fruit too… peaches are real yummy!) Oh, and since you have used cinnamon already in your fruit, you can back off a bit on your cinnamon. Bake @ 375 degree’s for 30 minutes. Serve it up straight away… still warm with a glass of milk, or put whipped topping or ice cream with it! Enjoy!